Coverage is of Preservatives, Enzymes, Gases, Nutritive additives, Emulsifiers, Flour additives, Acidulants, Sequestrants, Antioxidants, Flavour enhancers, Colour, Sweeteners, Polysaccharides, Solvents. Entries include information on: Function and Applications, Safety issues, International legal issues, Alternatives, Synonyms, Molecular Formula and mass, Alternative forms, Appearance, Boiling, melting, and flash points, density, purity, water content, solubility, Synergists, Antagonists, and more with full and easy-to-follow-up references. Jim Smith is the manager of Strategic Research and Technical Services for the Food Technology Center, Prince Edward Island, Atlantic Canada. He has worked in industry, universities and government and as a consultant to the food industry in Europe and North America. He has edited two previous books on food additives. Lily Hong-Shum is a professional food and sensory scientist for the Food Technology Center in Prince Edward, Atlantic Canada. She has worked extensively with government and industry supported research and global strategic alliance projects that have focused on value-added product and process development, additive and preservative application for post-harvest stabilization of food commodities, frozen/chilled shelf-life extension, sensory evaluation, and commercial scale production. "Additives have their advantages for the food industry in order to provide safe and convenient food products. It is therefore essentialk that as much information as possible is available to allow an informed decision on the selection of an additive for a particular purpose. 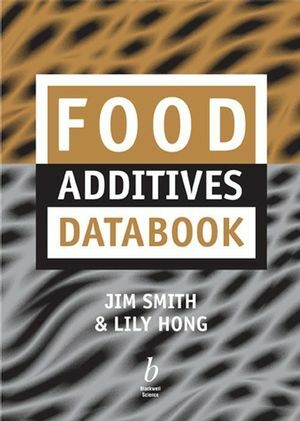 This data book provides such information - consisting of over 1000 pages and covering around 350 additives. This data book does provide a vast amount of information; it is what it claims to be! Overall, this is a very useful publication and a good reference book for anyone working in the food and dairy industry." "This book is the best I have ever seen ... a clear winner over all other food additive books .... a superb edition."